When there is a ham dinner, there must be some type of roll. We enjoyed these for the first time this past Sunday, but since then I have already made a second batch. Yes-- they are that good. It is a basic bread dough that is enriched with milk, sugar, and an egg. The dough is divided and shaped into small balls (employ your kitchen helpers with this job) before baked until golden brown. The crust is buttery and crisp while the inside is tender and sweet. And lastly, the fun factor bonus for kids and adults...individual pull-aparts. 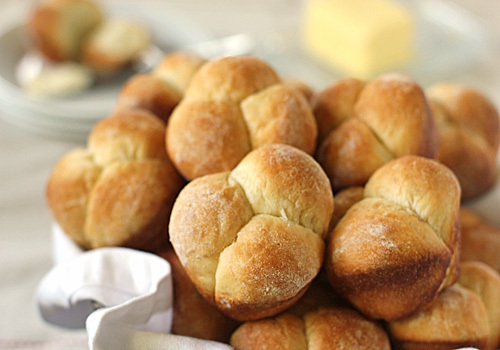 You really get three rolls in one as the separate dough balls bake together to form the cloverleaf-- it all comes together in one bite of yum. In the bowl of a stand mixer fitted with the dough hook, dissolve the yeast in the warm milk. Add the butter, egg, sugar, and 4 cups of flour. Knead until smooth. With the mixer on low, add enough flour to form a soft dough. Dough should just barely be sticking to the bottom of the bowl. Continue to knead until the dough is smooth and elastic, about 6-8 minutes. Turn the dough onto a lightly floured surface and shape into a ball. Place the dough in a large, lightly greased bowl, turning once to grease the top. Cover and let rise in a warm, draft-free place until doubled in size, about 1 hour. Punch the dough down and divide in half. Divide each half into 36 even pieces and shape into balls. Brush two (12 cup) muffin tins with half the melted butter. Place three balls in each greased muffin cup. Cover and let rise until doubled, about 30 minutes. Brush with the remaining butter. Bake for 15-18 minutes or until golden brown. Remove to wire racks. Serve warm. Enjoy! Sounds like a delicious, basic roll, Nicole. I can't wait to try it in my bread machine..
ooo these look awesome! cant wait to try them. btw i made your cinnamon chips bread with white choc chips and a doubled amount of cinnamon. it was AMAZING. i made it for some housguests and everyone loved it!! i searched everywhere for an alternative to cinnamon chips and found the white choc chips w/ the doubled cinnamon amount to be the best solution. and it was. the white choc gave it moisture w/o taking over the taste, which reg choc chips would have done. thanks for that amazing recipe! So pleased you found an alternative to the cinnamon chips and thank you for sharing it! Hi, I've been looking for a clover-leaf roll recipe for thanksgiving and I "think" I've found it. I'm going to make a test batch of these friday to see how they taste, react to the humidity (I'm in south, south Louisiana), and ease of preparedness. But I have a few questions: Can this be made without the egg? If so, how would that affect the dough? and Can this be made one day ahead of time and sit/rise in the fridge over night? What would you need to do to the dough if this is possible? If you know any of the answers to these (most annoying, I'm sure ha!) questions I would really appreciate it. Yeast bread loves a moist environment and this time of year in La. you should be golden. The egg provides a richness and tenderness like a brioche. Omitting it would completely alter the recipe. Having said that, if you did remove it from the recipe for allergy reasons, you would need to make up for the fat and liquid with butter and water/milk. As far as making the dough ahead, I cannot speak from experience with this particular recipe, but many roll recipes can be made, shaped, then refrigerated overnight. Bring them to room temperature and bake as directed.